Wellington, Florida (January 16, 2018) – The first of 13 $15,000 Turf Tour Grand Prix classes of the 2018 season was captured by Andrew Ramsay and the spectacular mare Cocq a Doodle, who put in a quick and efficient double clear effort to finish with a jump off time of 37.921 seconds over a course designed by Christopher Jones. Held on the springy, all-natural turf footing at Polo West, just off South Shore Boulevard, Friday’s Grand Prix and jumper classes of all levels wrapped up the fourth week of competition hosted by The Ridge at Wellington. Chasing Ramsay and Cocq a Doodle’s time was a field of 22 horse and rider combinations, with Ireland’s Darragh Kenny and Jessica Mendoza’s Horst Van de Mispeleare securing second with a jump of time of 38.021. Wednesday’s 1.30m Rising Star Classic winners, Sam Walker and Acardi Du Houssoit Z, gave the leading pair a run for their money with a double clear and a jump off time of 37.150, but a rail at the final fence cost them a placing. With the brilliant stadium lights, beautiful jumps, and an eager audience of diners at the Polo Bar & Grill, Friday’s Child Adult Jumper class had the feel of a Grand Prix and proved to be an exciting event for both riders and spectators alike. Despite a torrential downpour just a few hours before the 6pm start, Polo West’s sand arena held its own, providing exceptional footing for the 1.10m course. Riders had the option of a M&S/NAL/WIHS Qualifying Classic, or a speed round over two separate courses. Kate Taylor and the 11-year-old Chacco Blue topped the Classic. Don’t miss the final Turf Tour of the season, our April 1st $24,999 1.40m Finale at Polo West. In addition to the Grand Prix, the morning will host a 1.25m-1.30m division and Low, Medium, and High Schooling Jumpers running all day on the grass. Complimentary refreshments and lunch are provided, as well as super spacious warm-ups and the relaxed atmosphere The Ridge is known for. 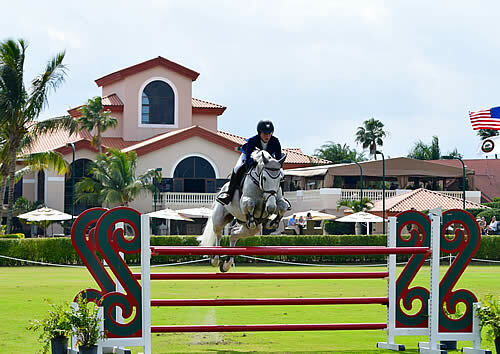 Polo West is located just six minutes from WEF. Click here for full schedule, contact information, etc. Wellington, Florida (April 11, 2016) – As the final horse soared over the final oxer under the spectacular covered arena of Jim Brandon Equestrian Center, the 2016 turf Tour came to a close following 13 weeks of high caliber show jumping and hunter competition. Finale week at the Turf Tour included some of the most technical courses, exceptional amenities, and world-class competitors that have set the series apart on the Wellington show circuit. The $24,995 Turf Tour Finale Grand Prix was topped by Brianne Goutal aboard Onira, one of a group of early double clears that bested the field of riders including Olympic champions and some of the top names in international show jumping. Hardin Towell and Flip clocked in at 35.286 in the jump off to place second, and Goutal and her other ride, Barlon van Groenhove, finished third with a double clear and 36.588. Subsequent double clear efforts were achieved by Olympic Gold Medalist Ben Maher and Jane Clark’s Tic Tac, top ranked Asian show jumper Taizo Sugitani and Hyperion Stud’s Imhotep, New Zealand’s Sharn Wordley with Hickstead’s Axel and Zabel D, and Chilean Olympian Samuel Parot with Cortina 186 and Cous Cous Van Orti. With the goal of developing young horses and advancing riders, the Turf Tour 13-week is a unique addition to Wellington’s growing winter circuit, offering riders top-tier competition, over $400,000 in prize money, and an unparalleled atmosphere. The ‘show when you like,’ open-ended schedule offers convenience and a more distilled competitive environment, without sacrificing the challenge and competition found at nationally recognized shows. Organized by Olympic show jumper Nona Garson, George D’Ambrosio, and Craig Bergman, the vision that inspired the tour’s conception was bringing back the old world flair to jumper classes by staging competitions on springy, natural turf surfaces away from the chaotic intensity of other show grounds. Due to popular demand, The Ridge also hosted a final schooling show, an addition to the schedule, on April 2-3, 2016 at The Ridge at Wellington. Featuring the same prizelist and schedule as previous shows, the series featured hunters and equitation on Saturday and Jumpers on Sunday. Wellington, Florida (March 30, 2016) – With the stunning equestrian estate of Tonkawa Farm as the stage, Week 12 of the Turf Tour welcomed some of Wellington’s top show jumping combinations as they battled it out on the turf in a number of divisions, from Young Horse classes and Schooling Jumpers to 1.30-1.35m classes and a challenging Grand Prix. Two days of nationally ranked show jumping were held March 23 and 25, 2016, as the second to last week of the 13-week circuit. With exceptional footing, gorgeous venues, a welcoming atmosphere, convenient scheduling, world-class amenities, and a range of competitors from amateurs to Olympians, the 2016 Turf Tour is setting new standards in show jumping competition. Daniel Coyle, assistant to decorated Irish show jumper and Turf Tour regular Conor Swail, added a Grand Prix win to his 2016 resume aboard Ridley. One of only four other double clear rounds on the technical and competitive course, Coyle and the gelding owned by Susan & Ariel Grange of Lothlorien Farm blazed past the timers with all the rails in place in a jump off time of 40.963, almost three full seconds faster than the second place ride, Marie Hecart with Starlight. Leslie Howard and Up & Blue Chapelle finished third with a time of 43.666, while Brianne Goutal and Rebeca Ls rounded out the double clear rounds with a time of 45.827. The course, which featured a number of tricky distances, spectacular jumps, and near perfect grass footing, was host to quite a few top names over the course of the day including Olympic Gold Medalist Ben Maher, Candice King, Lauren Hough, and Paul O’Shea. Prior to Friday’s Grand Prix, Wednesday saw the 1.30-1.35m begin the week’s competition, with over 60 rounds over the two courses. Olympic Gold Medalist Peter Wylde and Royal Flush shut out nearly 40 other horse and rider combinations to reign supreme in the first and largest division of the show. Maria Gabriela Brugal and Vasco topped the second division, and both classes again played host to some of the sport’s most recognizable names, most notably veteran Olympian Joe Fargis. Ring 2, which also featured the same exceptional footing of Tonkawa Farms’ springy polo fields, accommodated Young Horse divisions, Low, Medium, and High Schooling Jumpers, Child/Adult divisions, and a Junior/Amateur Owner Classic over the two days of competition. Citing convenience as key, organizers Nona Garson, George d’Ambrosio, and Craig Bergman structured both arenas so that riders may show when they please, anytime between 8am and 4:30pm. In addition, complimentary refreshments are served throughout the day and the Meadowbrook horse shuttle makes door-to-door trips around Wellington and back to the Turf Tour’s venues. Thanks to a generous sponsorship by Bright’s Creek, Coyle and the winner of the Junior/Amateur Owner Classic, Ahmed Alali aboard Fenway, will receive a 3-day, 2-night stay at the luxury resort near Tryon, North Carolina. As the grand finale and wrap-up of the 2016 Turf Tour, Week 13 will feature the $24,995 Finale Grand Prix, a special class highlighted by the increased prize money and an open entry, meaning any competitor is welcome without the need to qualify. Wednesday will host two 1.30-135M divisions as well as Low, Medium, and High Schooling Jumpers and 5-, 6-, and 7-Year-Old Young Horse divisions. The $24,995 Grand Prix Finale will begin on Friday, while the Schooling Jumpers, Child/Adult and Junior/Amateur Owner Classic will run concurrently. The Child/Adult and Junior/Amateur Owner Classic will be run as a sweepstakes during week 13, and The Turf Tour’s finale week will also include expanded complimentary breakfast, lunch, and refreshments, as well as its varied divisions and regular amenities. Set once again on the iconic fields of the International Polo Club, Week 13 promises to be a fitting finale to an exceptional season of show jumping on the Turf Tour. Due to popular demand, The Ridge has added an additional schooling show to the season’s offerings, to be held April 2-3, 2016 at The Ridge at Wellington. Featuring the same prizelist and schedule as previous shows, the series will hosts hunters and equitation on Saturday and Jumpers on Sunday. Wellington, Florida (March 24, 2016) – Samuel Parot brought determination, edge, and excitement to his narrow victory during Week 11 of The Ridge at Wellington’s Turf Tour. Securing a late won double clear in a time just a few hundredths of a second faster than the leader, Parot’s successful round closed out the two days of world class show jumping competition held March 16 and 19, 2016 on the Turf Tour. The weekly circuit hosts a variety of divisions from its headline $15,000 Grand Prix and 1.30-1.35m divisions to Young Horse classes and Junior/Amateur Owner classics, all set in gorgeous venues and with an unparalleled utopian atmosphere. With all of its courses for Week 11 set by renowned Pan Am, Olympic, and international course designer Leopoldo Palacios, Week 11 proved to be a hotbed of competition. Wednesday’s events kicked off with two 1.30-1.35m classes, Low, Medium, and High Schooling Jumpers, and Young Horse divisions on the sweeping and elegant grounds of the International Polo Club Palm Beach. The 1.30-1.35m classes saw more than 40 horse and rider efforts, with Lauren Crooks with Dora the Explorer and Sweden’s Alexander Zetterman with Contessa V topping the divisions. Due to concern over a strong weather system in the area, day 2’s classes were relocated to Jim Brandon Equestrian Center, where the spectacular covered arena hosted The Ridge’s second and final Hunter Derby Days the evening before. With the brilliant Grand Prix fences set, a slew of top international show jumping combinations tested their mettle over Palacio’s course. Parot proved exceptional with his first ride, putting in a double clear with his own Great Ben and taking the lead with a jump off time of 25.832. However, Beth Underhill and Count Me In, the defending champions of Week 10’s $15,000 Grand Prix, were yet to go and sure to make a bid for the top spot. Underhill and the powerful bay gelding owned by Sandy Lupton edged out Great Ben with a final jump off time of 25.817. With a blazing fast time and a history of victory on the Turf Tour, any gambler would put odds on Underhill for the win. However, Parot returned as one of the last rides of the day with Cortina 186, and epitomized the determination and skill of the top Grand Prix riders in Wellington. With a spectacular effort he and Cortina 186 swept past the timers with no rails and a time of 25.392 to win the class. From Pierson Rd. or Lake Worth Rd, head South on South Shore Blvd. Make a right on 50th Street, and then a right on South Road. The entrance to the farm is on the right. Photo courtesy of Equinium Sports Marketing/The Ridge at Wellington. Leopoldo Palacios Jugo, one of the most respected course designers in international show jumping, will be laying the courses for Week 11’s competition on the Turf Tour, held at the International Polo Club! Don’t miss your chance to ride over his spectacular designs, and enjoy the unique and competitive atmosphere of the Turf Tour. Palacios has served as course designer for some of the most prestigious competitions in the world, including the Olympics, Pan Am Games, World Equestrian Games, and is known for his ability to present optimum technical sport conditions in combination with artistic presentation. Palacios will design for the Turf Tour’s 1.30-1.35m, Low, Medium, and High Schooling, and Young Horse divisions on Wednesday, and the $15,000 Grand Prix, Child/Adult Jumper Classic, and Junior Amateur Owner Classic. Don’t miss this opportunity to ride over Olympic caliber designs at the spectacular International Polo Club! For those interested in entering the Turf Tour competition or any of the events hosted by The Ridge at Wellington, contact RidgeShows@aol.com, 908 500 0996, or view a full prize list online. Farms or individuals seeking information on sponsorship, packages for upcoming events, or with any other questions regarding the event, please call 908 500 0996. Meadowbrook Horse Transport offers a door-to-door horse shuttle to each of the Turf Tour venues, the including the Hunter Derby. To schedule pick up, contact them at 954 415 7217. Wellington, Florida (March 14, 2016) – Canadian Olympian Beth Underhill brought her in-saddle savvy to The Ridge at Wellington’s Turf Tour Week 10 Grand Prix field, holding off ten other first round clears to top the $15,000 Grand Prix class. Held on the iconic polo fields of Palm Beach’s International Polo Club, this week’s Turf Tour Grand Prix and 1.30-1.35m classes featured show jumping’s top names, as well as High, Medium, and Low Schooling Jumpers, Child/Adult, and Junior/Amateur Owner divisions. The Turf Tour’s unique combination of atmosphere, competition, amenities, stunning venues, and open in-gate policy creates a utopian show experience that is redefining the paradigms of Wellington’s horse sport industry. Underhill, riding for owner Sandy Lupton, rode strategically and efficiently, putting in a double clear on Friday aboard Count Me In to finish on a super-fast jump off time of 34.888. Her planning and excellent execution paid off, as less than a second separated the pair’s ride from second place. Angel Karolyi and Hollow Creek Farm’s Indiana 27 finished their jump off (35.066) in an exceptional and exciting attempt to catch Underhill and Count Me In. New Zealand’s Sharn Wordley and his own Zabel galloped through the timers to finish in third at 36.225, and Wordley and Hickstead Axel raced to fourth in 36.361, just a tenth of a second slower than Zabel. Wellington’s Tina Yates and Cicomein VDL rode to fifth with a double clear and final jump off time of 36.905, with Lauren Fischer aboard Tosca Du Feugre securing sixth with a time of 38.152. Wednesday’s $2,400 1.30-1.35m competition saw the fast and accurate combinations of Alexander Zetterman with Contessa V and Jack H. Towell with Flip topping the rosters, kicking off Week 10’s competition. Friday’s Junior Amateur Classic was skillfully won by Michelle Kamine with her own Loreana and the Child Adult Jumper Classic was dominated by Madeleine Mallon aboard Amanda Scaffer’s Antonio. Winners of both classes, in addition to their prize money, were awarded a three-day stay at the beautiful Bright’s Creek Resort in Tryon, North Carolina. Winners of the Junior/Amateur and Child/Adult Jumper classics in upcoming Turf Tour competitions will receive this exciting award from Bright’s Creek. For more information visit the Bright’s Creek website. The beautiful and technical courses in both fields, designed by Nick Granat, focused on the application of strong basics and options to challenge both horses and riders, allowing for green competitors to build confidence and skills while seasoned competitors sharpened and fine-tuned their talent. “Our goal is giving competitors a chance to experience everything, from riding on the turf polo fields at the spectacular International Polo Club, to competing under the lights in a spectacular covered arena,” said George D’Ambrosio. 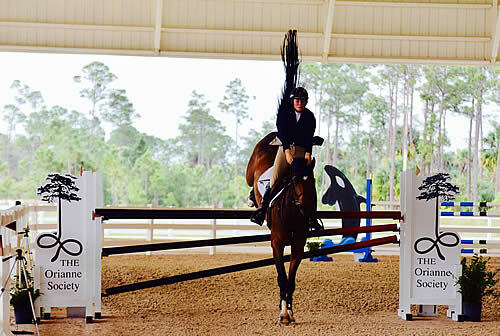 This dedication to variety continues next week, as The Ridge at Wellington welcomes riders to its second and final Hunter Derby Days event, held in the expansive covered arena at the Jim Brandon Equestrian Center in West Palm Beach, less than two miles from Wellington. The Turf Tour’s competition at IPC continues Wednesday and Saturday, March 16 and 19, with the Hunter Derby classes being held on Friday, March 18. Featuring a $5,000 Dietrich Equine Insurance USHJA National Hunter Derby at 1:30pm and a fabulous evening class, the $15,000 USHJA International Hunter Derby at 7pm, this celebration of the grace and elegance of performance hunters also serves as an exclusive way to qualify for international titles and the National Hunter Derby Championships. Wellington, Florida (March 7, 2016) – USA’s Clementine Goutal and the elegant dark bay gelding Caballito proved unstoppable during week 9’s Turf Tour, held at the magnificent grass field of the Wanderer’s Club on March 2nd and 4th, 2016. Following a win in one of the two 1.30-1.35m classes during Wednesday’s competition, Goutal and Caballito, a 14-year-old Oldenburg gelding, repeated that winning performance in Friday’s Grand Prix, topping a large class filled with some of the most recognizable names in show jumping. Caballito’s double clear effort, and an exceptionally fast jump off time of 36.260 seconds, landed the pair in the lead about half way through the class. Goutal soon followed her winning round with an equally impressive double clear aboard the 9-year-old Selle Francais mare Tixie Des Hayettes, and a jump off time just hundredths of a second slower than Caballito’s for a second place finish on 36.626. Behind her top two Grand Prix placings were New Zealand’s Sharn Wordley aboard Zabel D, owned by Sky Group, finishing with a double clear in 37.381, and Olympian Beat Mandli with Celina, a mare owned by Grand Road Partners, LLC and the other returning champion from Wednesday’s 1.30-1.35m. Fifth went to Nina Fagerstorm of Canada aboard Quel Cadan S Z with a double clear in 38.110, and sixth was Ansgar Holtgers of Germany aboard Way of Life H, also double clear with a jump off time of 39.925. Other top names in the class included Todd Minikus, Katherine Dinan, Peter Wylde, Olympian McLain Ward, and Catherine Pasmore. In addition to the Grand Prix, Friday’s competition in Ring 2 featured Low and Medium Schooling Jumpers, plus classes for Junior/Amateur-Owner and Child/Adult classes, including NAL Classics for both groups. Intended to act as a catalyst for the growth and development of horses and riders, the Turf Tour combines breathtaking venues with world-class amenities, consistently drawing top competitors. Week Ten of the Turf Tour will again take place on the beautiful grounds of the International Polo Club on Wednesday and Friday, March 9 and 11, 2016. Week Eleven’s jumper events will also be held at the International Polo Club, with the second day of competition being moved to Saturday to accommodate The Ridge at Wellington’s second Hunter Derby Days competition on March 18th. Starting with the USHJA $5,000 National Hunter Derby at 1:30, the event will continue with the exciting $15,000 USHJA International Derby, a nighttime class that will take place in the fantastic, oversized covered arena at Jim Brandon, setting the stage for a unique and welcoming ambiance to showcase the elegance and beauty of performance hunters. VIP tables will be available for this prestigious event, and can be reserved by contacting ridgeshows@aol.com.